Accueil Articles Eminem is the artist who sold the most albums in 2018! Rap God, even at 46! 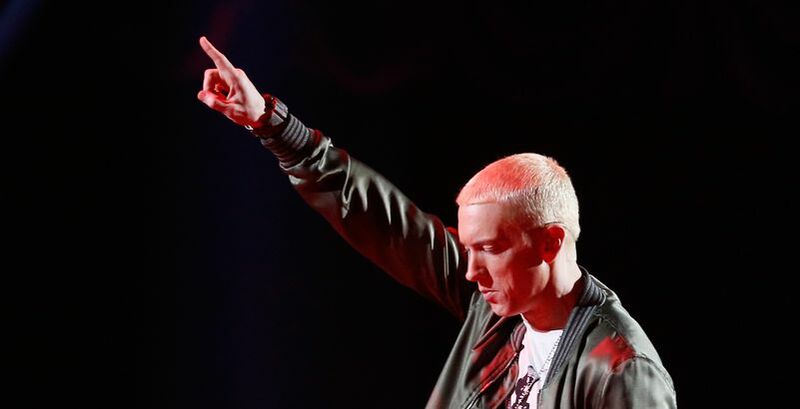 While some thought it ended after his album Revival , criticized by critics, even if commercially it has worked pretty well, Eminem surprised everyone in 2018 by unveiling by surprise the explosive Kamikaze , August 31, 2018 . Back to raw rap and farewell to Revival's pop chelou, Em 'is honed like never before on this album and blows up all his haters, as if he were still 20 years old . . .
At the beginning of the year 2019, Buzz Angle Music has drawn up a complete and extremely interesting review of album sales, singles . . . in the year 2018 . And what stands out is that Drake dominated ( almost ) from head to toe, the charts with Scorpion since it is the artist who was the most listened and the most streamed in front of Post Malone and XXXTentacion . Except that for the sales of physical albums , it is the rapper of Detroit who is in the lead with 755 027 units, thanks to Kamikaze: 373 067 but not only . . .Indeed, the rest of album sales: 381 960 ( to be precise ) comes from sales of his back catalog and his old albums . Reconciled with Kamikaze, fans ( early or not ) had to rush into the shops to buy not just Kamikaze but the other albums of their idol . We know a certain MGK who must be in PLS at the moment because Em was not mistaken in his diss track Killshot : "I'm 45 and I'm still outselling you" ( = I'm 45 but I sell much more than you ) . Nicki Minaj clash Cardi B again! NICKI MINAJ IS A CRAZY CARDI B ON QUEEN RADIO!